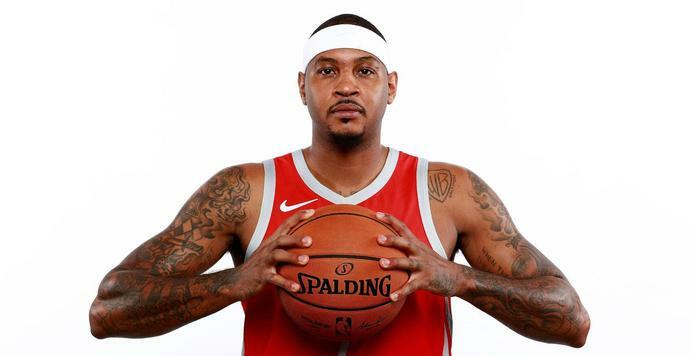 Carmelo Anthony will be in a new role with the Houston Rockets. The 34-year-old forward, who has started every game of his NBA career, agreed to a deal with Houston in mid-August after he received a buyout from the Atlanta Hawks. But he is expected to come off the bench when the team open their regular season against the New Orleans Pelicans on Wednesday. Anthony told ESPN everyone in Houston is "on the same page" heading into 2018-19. "I know what I still can do and what I still have," Anthony said. "So, my confidence from that standpoint, yeah, I always have to say, 'I don't want to come off the bench'. "But knowing that ahead of time and having those conversations and going game to game and understanding, 'OK, we might need you to do this tonight. We might need you to do that tonight,' I have a clearer understanding of what my role is." Rockets coach Mike D'Antoni told reporters he knows Anthony faces a "big adjustment" coming off the bench. "I know it's not the ideal situation for him, because he's a Hall of Famer and all that," D'Antoni said (via ESPN). "I know it's a big adjustment, but you know what? He's true to his word. He said he'd do anything for the team. We think that's best today. It might not be best later - we don't know - but having him is something that we didn't have last year. Obviously, it's really good." Anthony, a 10-time All-Star, was traded from the Oklahoma City Thunder to Atlanta in exchange for guard Dennis Schroder in late July. He hit just 40.2 per cent of his shots and averaged a career-low 16.2 points per game during his lone season with Oklahoma City in 2017-18. Anthony said he thinks he is a "natural fit" in Houston. "This is a very unique and special opportunity, for me as an individual," Anthony said. "To be part of a team who already has some success, and to come in and be a part of that and have [an] opportunity to kind of help this and take it to the next level, and hopefully win a championship. That gives you a different motivation." BOSTON (AP) - The Celtics are preparing for their Game 2 matchup with the Pacers aware their series-opening win was notable more for its ugliness more than the outcome.